Our Mission: To Improve Performance! 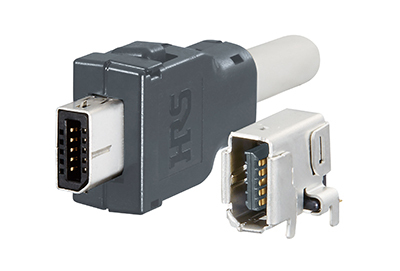 The ix Industrial™ arose from a collaboration between HIROSE and HARTING. It offers a broad technological basis for a new standard in the area of the familiar RJ45. As a response to the challenging and increasing demand for global digitalisation, both partners – HIROSE and HARTING – recently agreed to combine their strengths. The result of this joint effort is the ix Industrial™ – a new miniaturised Ethernet interface for high-speed data rates. The two partners have jointly standardised the ix Industrial™ mating face in compliance with IEC/PAS 61076-3-124. Meeting this standard provides for future technologies and applications in IoT (Internet of Things) and others. The mass production is planned to start in April 2017. "Together, HIROSE and HARTING will now be able to offer our customers the combined expertise of two leading interconnect technologies, with their global presence and proximity to customer design and manufacturing locations." said HIROSE President Kazunori Ishii at the press conference held at electronica. Speaking at the same event, Philip Harting, Chairman of the Board of the HARTING Technology Group, added: "Successful collaboration in developing, standardising and marketing the miniaturised connection technology for 10Gbit Ethernet is a genuine win-win situation for both companies. We want to extend this partnership further." HIROSE and HARTING will collaborate even more closely in research and development in the future. More standards are also planned. The mission of the ix Industrial™ is clear: for a better high-speed performance in industrial data traffic. It is smaller, more robust and powerful in comparison with the RJ45. Due to this small robust design, it makes fast Ethernet available in a number of different industrial applications. The socket has 5 THR (Through-hole reflow) shielding contacts for maximum retention on the PCB. The robust structure of the ix Industrial™ ensures stability in harsh environments. With performance to Cat. 6A, the ix Industrial™ interface is configured for 1 / 10 Gbit/s Ethernet and is therefore future-proof. High current load capacity accommodates the PoE (Power-over-Ethernet) applications of today and tomorrow. The combination of high-speed data transmission and power in one interface, provides ideal solutions for space saving requirements. Caption: The HIROSE ix Industrial™ interface is standardised in compliance with IEC/PAS 61076-3-124.